593 p., 15,6 x 20,9 cm. With contributions by Wolfgang Bartuschat, Günther Baum, Oswald Bayer, Martin Bondeli, Wolfgang Bonsiepen, Heinrich Clairmont, Eva J. Engel, Günter Gawlick, Hans-Jürgen Gawoll, Ursula Goldenbaum, Manfred Lauermann, Hans-Christian Lucas, Johannes von Lüpke, Günter Meckenstock, Peter Rohs, Maria-Brigitta Schröder, Winfried Schröder, Eva Schürmann, Gideon Stiening, Burkhard Tuschling, Norbert Waszek and Margarete Wegenast. 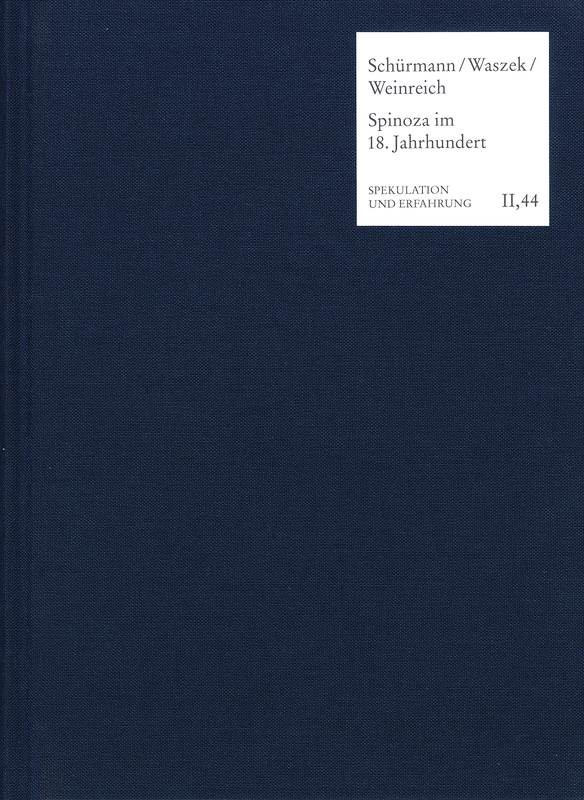 The articles in this volume give a clear picture of Spinoza’s role as a figure of thought, an inspirer and a stimulus and even an enemy stereotype in the 18th century German history of ideas by identifying the various aspects of the history of his reception and his impact. The scope of this study, its thorough knowledge of the intellectual debates and awareness of methodological and conceptual challenges are certainly impressive.